Today’s Nic’s Pick, Three Farmers, hits home for me for 3 reasons: the business is located in Saskatchewan (my home province), is run by 2 rockstar women, and was created by a trio of Canadian farmers dedicated to connecting with consumers by bringing sustainable, quality food products to the marketplace. If you check out the videos on their website, you’ll see just how genuine and committed these entrepreneurs are. Their authenticity is of huge importance to me because although a business needs to make a profit, we need to make sure the products we’re getting are of the highest quality possible, especially when it comes to our food chain, which is constantly being compromised. 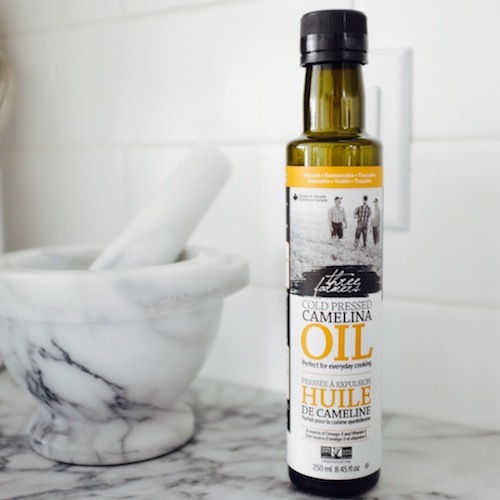 Three Farmers has other products (i.e./ roasted chickpeas and the new Pea Pops), but this Camelina Oil is the focus today. I use it almost every day – for dressings mostly, but because it’s got one of the highest smoke points, it can also be used for sauteeing (or grilling or stir frying) as you would use an olive or coconut oil. I always use it for my roasted root vegetables (recipe website). Camelina oil is an antioxidant, anti-inflammatory, anti-arthritic, immune booster and can also be used as a hair conditioner (i.e./hot oil treatment) and skin moisturizer! Much of this has to do with it’s high vitamin E and omega fatty acid content. Hats off to you, Three Farmers, for staying focused on your mission and creating a consistent, nutritious, and authentic brand.